Hello lovelies, I just have to start with how much I appreciate you reading here and that I love all the support you give me and my painted furniture business. It has been fantastic meeting so many of you with the painted furniture classes and I look forward to continuing that when I have my studio. Life has been good lately. I've finally started taking better care of myself and am seeing changes already including being even happier with life. I am normally quite happy but more sleep, more water, better food and lots of exercise really makes you feel good. I'd forgotten :) I'll let you know how I get on but it's good to give myself priority and I think I'm probably not the only one who that happens to (tell me I'm not anyway!!) I gained about 20 kgs, 5 years ago, with a mis-prescription of antidepressants. I wasn't depressed, I was cranky/cross from a Mirena IUD that sent me a bit mental and the doctor just prescribed antidepressants and to be honest, it was a bit like I was drunk all the time (ha ha Phil loved it as I am great fun after a few drinks) but I stopped all my good habits and stacked on the weight. With one thing and another I never lost it and even gained another 5 kilos and now it's more than time to lose it again. I have a couple of little projects to share. I've been packing up the half the house (which actually ends up involving most of the house as we move things around) in readiness for our renovations. Less than three weeks till demolition! It's such a big undertaking and I am very excited. Ask me again in 5 months and I may not be so happy about it, but for now I can't wait! I bought fantastic bunks from eBay last weekend and we put them up straight away (after giving them a good old scrub) and the kids are now sharing a room and loving it. It's very nice putting them to bed together and hearing them chat after lights out. I recently painted and upholstered this little stool that Emily was given by her grandmother. She was quoted a ridiculous amount by an upholsterer and as I was already painting her sideboard (which I'll share tomorrow) I said I would do it at cost for her. She bought the fabric in Northbridge and unfortunately bought about 10cm too little but I managed a work around with a wide band. I actually love the look and would definitely do that again on a piece. I think the wide band makes it very classy rather than using gimp braid. I also made my gorgeous friend a table runner for her birthday. She was recently lamenting the state of her dining table. I think her dining table is probably the most beautiful table I've ever seen but she was thinking that it wasn't styled nicely, so for her birthday I made her a table runner and bought her a lovely silver painted tray (from Bed Bath n Table). Of course I had to test it out and photograph it at home before I took it to her. Below you can see it on her table with beautiful birthday flowers she received from her new job. Lucky girl. Some of you may recognise the fabric if you've been following me for a long time. It was the back hanging for my booth at the now defunct Balmain Road Antiques Centre. It is kind of fitting that I used it for my friend's table runner as she has been one of my greatest supporters on this creative journey and when I told her where she'd seen the fabric she said she loved it even more that it once hung in my booth. Oh I miss having my little booth. How I loved filling it each week. Such a shame about the owner and his unethical ways and that it went into liquidation. It was very handy for me as it was just at the end of my street. A perfect location. Oh well, some things don't work out do they! I thought you might like to see the before photos of some pieces I'm painting this week. Nicole asked me to find her a hall table. 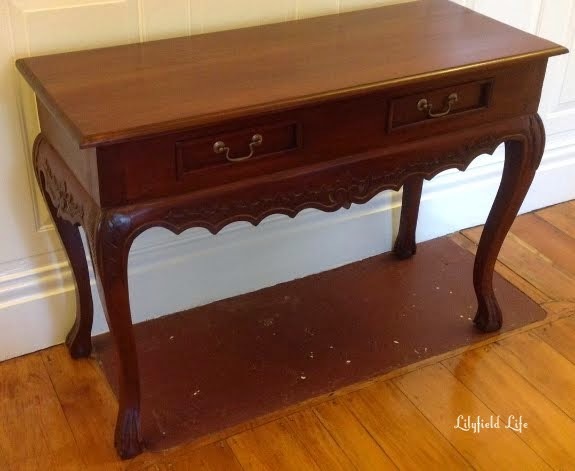 This one I found online fit the bill perfectly and I will be painting it French Provincial black. Joanna and David are modernising their house and have asked me to paint this Japanese Tansu in a bright white. It's currently strewn all over the floor in my lounge room with two coats of primer. I will also be painting this little piano stool white and recovering the seat. It'll be for sale. Wish me luck for the work, the house pack up and the healthy regime. I am really looking forward to some positive results on all fronts. Hi Fiona, I always love seeing what you are up to. Thank you for your honesty about your weight struggles and quest for a healthier life. You are very inspiring so I am sure we will see wonderful results. I love the little stool and seeing your other projects, and your cute kids. thanks so much Sylvia, much appreciated. i am so happy for you with your happy healthy attitude! and i love that stool- the fabric is STUNNING! the colors are amazing. thanks so much Carol, I'll let you all know how I get on. fingers crossed. Wow, Fiona - you sure are one busy lady! Good luck with the weight regime and your home renovations. I hope it is smooth sailing. Wishing you a great day. You did a perfect job on the stool! I love it! That fabric is great! Oh, I love the wood on the Japanese and would not want it white. Maybe darken the wood a bit to bring out more of the grain highlights. I know Rose what you mean about the Tansu but I’m just doing what Joanne wants. I did ask her was she sure and they’ve had it a long time and want a change. Hi Fiona, didn't realise you were so close to demolition time -- how exciting for you! It's happening!! Great honest post Fiona as always you are so good at sharing. I am sure the weight will fall off you when you start the reno. I cant wait to see the house when it is finished and how you style it. You will have to hold a painting 101 class part 2. You look after yourself. So sorry I'm not sure which shop it was, maybe one near shades of pale?